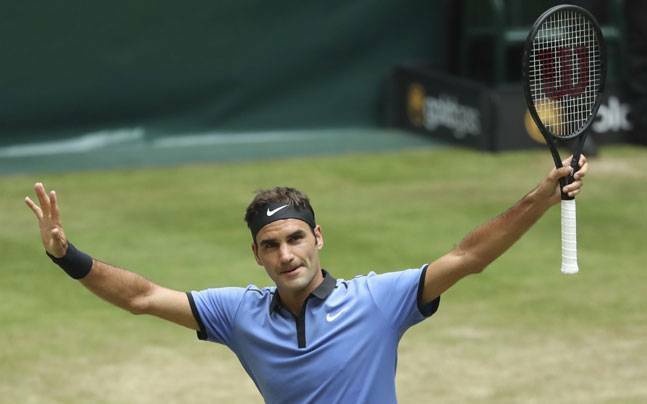 Roger Federer didn't play his best tennis this week in Halle before the final, but he was simply wonderful against Alexander Zverev, beating the young German 6-1 6-3 in just 52 minutes for his 9th crown in Halle! The 18-time Grand Slam champion was surprised by German veteran Tommy Haas on his return from the two-month break last week in Stuttgart but brushed off any doubts over his form in Halle. Federer produced an imperious display against world number 12 Zverev, who is regarded as one of the world's most promising players and reached the top 10 this year after winning three titles. In taking the opening set in just 24 minutes, Zverev already looked a beaten man and, even though he found a way past Federer in last year's semi-final, Federer ensured that a repeat was never on the cards. The 35-year-old Spaniard - who had spurned a match point in his previous final appearance against Grigor Dimitrov in 2014 - held on to triumph 4-6 7-6 (7/2) 7-6 (10/8). He then converted his first match point. Fourth-seeded Marin Cilic avoided becoming the latest high-profile player to depart early by beating Stefan Kozlov 6-0, 6-4 and is to play another American, Donald Young, in the last eight. "It was by far my best match of the week". Federer will now play Alexander Zverev in what will be his 11th final in Halle alone. "I played against a right-hander from the baseline in Sugita, a left-hander who serves and volleys all time (Zverev) and Mayer plays very differently to everyone else. He uses slice, he comes in, he chips and charges, he loops the ball and serves/volleys a little bit, so he's really going to throw everything at me", said the Swiss great.